Course architect Rees Jones has been accredited with four of the last five renovations to the U.S. Open courses. The Sea Trail Jones Course, a 2006 U.S. Open Qualifier Course, recently underwent its own renovations, making it even more of a perennial favorite of both visitors and locals. The 1999 designer-approved renovations brought a more naturalized look with native grasses and wildflower plantings to the Sea Trail Jones Course. 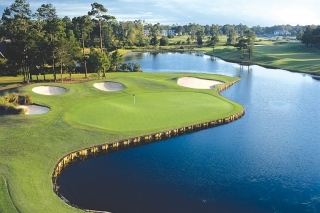 This straightforward Sea Trail Jones Course look is pleasing to the eye with generous mounded fairways, bordered by scenic lakes and water hazards on 11 holes, old oaks and towering pine trees. Book tee times or packages for the Sea Trail Jones Course or other courses north of Myrtle Beach with On the Green Magazine.